Pure White Tea, handpicked and handmade for you by family tea company, Dilmah. White is the colour of innocence, purity and goodness. And so it is in tea. Real White Tea, made from the tender bud of a special variety of the tea plant, Camellia Sinensis, is handpicked before the sun rises. They are carefully placed in silken pouches, shielded from direct sunlight and dried under the care of a teamaker. At just the right time, the teas are lightly baked. 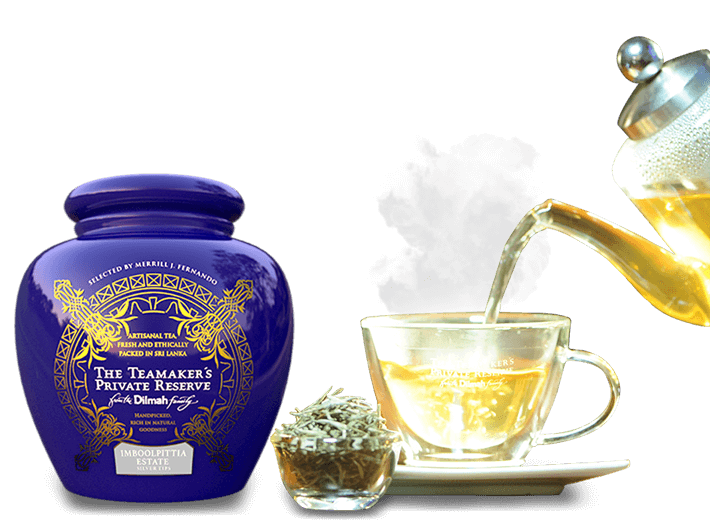 A rare and indulgent experience in tea, Real White Tea is subtle and sophisticated in aroma and taste. White Tea should be enjoyed pure, without the addition of flavours or mixed with other grades of tea. White Tea is not always white. In Ceylon (Sri Lanka), white tea is known as Silver Tips. Dilmah Pure White Tea consists only of the bud of a special cultivar of Camellia Sinensis which is selectively hand-picked and contains significantly higher flavonoid (antioxidant) levels than green or black tea. Producing Real White Tea requires expertise, patience and a great deal of effort. The special Silver Tips cultivar produces long and impressive apical buds, and leaves that are dark green in colour. The unopened buds or tips are coated with fine, silvery down. Silver Tips grow at most elevations and flush (produce the leaves and tender buds that are hand- picked to make tea) profusely under hot, wet and steamy conditions. The bush does not spread its branches easily and generally takes on the tapering bowl shape similar to a red wine glass. It tends to grow tall – upto 60 feet if left untended - and would require pruning at short intervals ranging from around 4 years in the high elevations to 2- 2 ½ years in the lower areas. Silver Tips, White Tea bushes are not high yielding when compared to other teas. An expert Tea Picker would only be able to pick around 250g of Silver Tips in a day. It takes 5 KG of freshly picked tips to make just one kilo of Silver Tips White Tea. The fine and sensitive buds need to be expertly picked, at just the right maturity, and they are then carefully protected in a silken pouch to prevent bruising. Silver tips are plucked in dry weather and the harvested buds are spread out on a wooden or natural cane surface and dried under the filtered sunlight of the dawn. This is done under intense scrutiny, for a short time each day over a period of 4 or 5 days. As this happens, the tips acquire a unique character.